Enjoy Both a History Lesson & Abundant Wildlife in This Full Day Tour. On this tour you will hike through the first protected park established in all of Costa Rica, enjoying both a history lesson and abundant wildlife. Santa Rosa National Park is one of few remaining areas from Southern Mexico to Panama to feature tropical dry forest: deciduous trees that have adapted to a warm climate. Santa Rosa is home to deer, coati, and other small mammals, large cats like the jaguar, monkeys, and over 250 species of birds. Observe a staggering number of butterflies, moths, and other insects. This hike is considered easy to walk and lasts two to three hours. 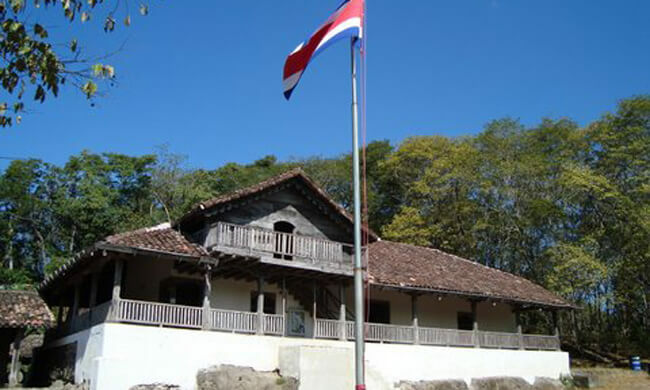 After the hike, you will also visit one of Costa Rica’s most important monuments, La Casona, which is also located within the park. This former hacienda has great historical importance as many battles have occurred here over the past two centuries. Learn about the prominent confrontation between the Costa Rican army and William Walker’s filibusters in 1856, and the fire by the area’s poachers in 2001, among other events. Then take a short ride to Cañón de la Vieja Lodge to enjoy a traditional Costa Rican lunch. Hop back in the van for another 45-minute ride to the old colonial town of Liberia. This area is still highlighted by its cowboy roots: surrounding cattle farms, traditional town center, and historic white buildings constructed to “beat the heat.” Walk around with your guide and finish up at a souvenir shop. Your tour includes: transportation, bilingual guides, entrance fees, bottled water, lunch. What to bring: Guests should wear hiking/running shoes; bring a hat, camera, spending money, and sunscreen.